Many years back yonder, some friends and I had a weekend camping trip planned to the coast. A hurriance warning scared us off, and we ended up car camping at an empty field in the middle of an old farm owned by the grandfather of one of my friends. It was so comfortable compared to our usual outings that we started referring to it as The Weekend of Gracious Living. That’s how our weekend felt. Earlier today, while still at the resort, I said to Mr. Four, “So, did you forget you lived in Cairo?” and he said yup. The both of us, for a little while, were so immersed in relaxation that we totally forgot about our regular lives. The resort was fantastic, and, to our delight, very accommodating of kids. The lagoon-like pool with its multiple graded entries and large shallow areas was great fun for the boys. And the beach was perfect too, with a playground, lots of clean sand, and a shallow swimming area with lots of little fish to chase. Mr. Four and I sat on our comfortable beach and pool recliners and read novels while the boys dashed around, swam, and played. And there were tons of other (mostly European) families there as well, so our kids weren’t the only ones running around and having fun, which meant we didn’t have to worry about them bothering anyone. The other day I mentioned that I feel like I’m a day ahead, not just six hours ahead, of the east coast. I still do: at 4pm today, we were back home and getting ready for our last evening before work and school resume tomorrow, while in the US, it was 10am and time to start the weekend. Very odd. Anyway, I have more to say about our beach trip (with photos! ), plus I’ll start answering your great questions soon, so hang tight and check back. In addition to being six-seven hours ahead of the East Coast (depending on daylight savings), it also feels like we’re a day ahead because of our Sunday-Thursday work week. So right now, as I’m about to start packing for a weekend trip, folks in the US are in the midst of a Wednesday, halfway through their work week. It’s also really weird on Sunday morning when I get to work and realize, even at noon, that my friends and family back home are probably still sleeping on their day off. So we’re going to a resort at the Red Sea this weekend, a place only about an hour and a half from Cairo, and we’re all excited. Giggle, as far as we know, has never seen the sea up close (though he’s flown over the Atlantic twice), and he talks about it constantly. The sea there is very shallow, so very kid friendly, and this place has a beautiful shallow/ramp entry pool (a colleague went last weekend and was raving about it). Plus the very reasonable rate includes breakfast and dinner buffets. It’ll be great to get out of the city, which we’ve been half-planning to do for a few weeks. I’m glad we’re finally making it happen. And the resort is very western-oriented. What does that mean? Alcohol! And shorts and skirts that don’t cover the knees! In fact, guests aren’t even allowed to cover up too much. One of their few rules goes as follows: “Only proper swim wear is allowed. No cut off jeans, pants, long costumes dresses & long swimming suits are allowed in the pool.” I suspect they added in the part about cut off jeans so it didn’t look like they were targeting Muslim women. Or maybe not. We’re on a tight timeline tomorrow as I have an early afternoon meeting at work, and then I’ll dash home so we can leave and our taxi driver can back to Cairo for his family’s iftar. So I’m packing tonight and won’t have much time for blogging. I probably won’t be checking in much and I won’t be posting any entries for a few days. In the meantime, please ask some questions (the first few are great and merit some thinking on my part). 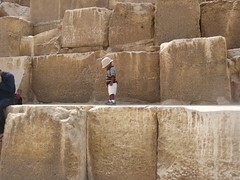 Of course I have more to share about life in Egypt, the boys, Mr. Four, and lots of other things, but I’m wondering what my faithful readers want to know. 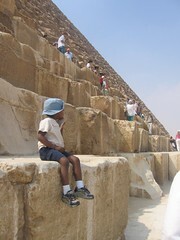 Last Friday we went to the Pyramids again. Why? Well, that’s a question I’ve been asking myself for days, but unfortunately myself is being uncooperative and won’t explain a thing. Actually, I know why we went. We wanted to go to the beach, but we futzed around with planning and it didn’t happen. (You actually have to make these kind of plans in advance here! Can you believe it?!) 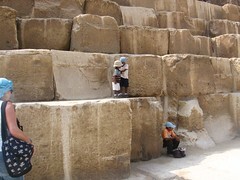 And some friends had a group trip planned to Giza, so along we went. It was nice the first time, but that trip was all about the camels. This time, I wanted to learn something. Friends, I’m here to tell you that learning is overrated. What’s underrated is the debilitating combination of heat, general crankiness (I had worked late the night before and Mr. Four hadn’t slept well himself), and being on a trip not planned with children in mind. Plus add in really aggressive peddlers of made-in-China Pharonic crappola. 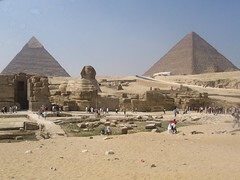 I’ve been in Egypt six weeks and already I’ve decided that any friends who come to visit are going to have to go to Giza by themselves. That’s right: I’m already sick of the remaining wonder of the ancient world. Thank goodness the rest have disappeared! Mr. Four is chiming in here that the trip wasn’t that bad. And the kids say they liked it, though Giggle was quick to add he wants to go to the beach this next weekend. In any case, I am pleased with some of the photos. 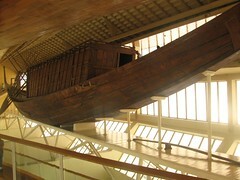 And we did see the very cool Solar Boat (so named not because of its energy source but because of a poor translation of something that seems really to mean Sun Boat), which was found in pieces buried next to a pyramid, and then carefully reconstructed over several years. The boat was buried, we were told, so that the souls of the dead Pharoahs could catch a ride if need be. At some point I hope to forget how crabby I was that day and only remember the good parts. Oh, and this weekend? We’re going to the beach. Oodles more photos are on my flickr site (the latest photos are the last ones). Not really, but we are making friends. Or at least people are being nice to us. Mr. Four was invited to play golf last week with a stay-at-home dad at his country club. It was still pretty pricey, even with a discount, but Mr. Four had a good time. You’ll have to ask him to comment on the golfing. Oh, wait, I just did. He said, “It was good” and “it was nice.” So there you go. Also, I was invited to lunch by a nice American woman colleague. Plus we had another playdate with our friends with the daughter who is also from Ethiopia. The boys really like her. They even gave her kisses and hugs when we said goodbye. And she cried when she realized we weren’t going with her! How sweet (except for the part where she was sad). And-because there’s more!-we were all invited to dinner on Friday night! I don’t want to go into details, but the people we visited have a certain access to a massive quantity of American goods. I walked into their apartment and felt like I stepped through a worm hole back to the US. I practically swooned at the sight of Breyer’s ice cream. They had candy corn! And Hershey’s kisses! It all seemed so incredibly normal. The best part is that they liked us! So maybe we’ll be invited back. The worst part is that now I’m homesick. A very wise friend (ha, really I’m talking about one of three people total when I say “friend in Cairo”) said it was a very dangerous time to visit the other friend’s house. I was just starting to forget about some of the comforts of home. Ah well. The brownies, French vanilla ice cream, and warm hot fudge were so worth it. I worked late on Thursday, til 9pm, and took a taxi home in lieu of the metro. I hear it’s quite safe even at night, and Cairo is considered a safe place for women to walk alone most times of day or night (you may get verbally harassed, but you won’t get mugged or assaulted), but I decided to forgo experiencing this for myself. So I hailed a cab downtown, and almost right away the driver asked me, a couple of times, “Are you krees – tee – un?” before I finally understood he was asking me if I was Christian, a pretty safe bet to make of a white foreigner. But it’s not a question I hear very often, and I was flummoxed. Technically, no. And in the US, I would answer no. But why was this guy asking me this? Because in the sense of how I was raised, I am Christian (Catholic, actually). So, tentatively, I said (much to my own surprise), “Yes.” Then he told me he was Christian. He also asked me how much I’d pay for him for the ride. That’s a big no-no in Cairo’s taxi-land. The passenger is expected to know a fair fare (ha ha) for the ride, and that’s what the driver expects to be paid. No meters, no conversation, nothing. I knew a fair price for my ride was about 25LE, or even 18-20LE at non-busy times. So I offered, “20?” I should have been more confident. He said no, so I fussed and grabbed the door handle and said I was getting out. He found this amusing and retorted, “25.” Deal! That was pretty much the entirety of our conversations. But he was a nice guy. He didn’t know my part of town very well, and I was having a hard time recognizing landmarks in the dark, so we went a round-about way to get to my building. I actually paid him 30LE, about $5.35. Not shockingly generous, but money goes a long way here. And he was a really nice guy. I was glad I fibbed my way through his original question. Fast forward to Friday night. Our family was invited to a (new) friend’s house for dinner. She lives near us, but in a different area of town. She gave me directions, when usually I just tell the driver our destination. The other complication was that it was just before dusk, meaning just before iftar. Meaning there was a good chance most drivers hadn’t eaten for over twelve hours. The roads were already pretty empty, as most folks were home for iftar, and we felt lucky to get a taxi at all. In attempting to direct the taxi, however, we got close but missed the street. And, surprisingly, the driver didn’t know how to find the street we wanted, a pretty significant one. He got increasingly frustrated, as did we. We own mobile phones here, but they’re not set up yet (two different processes here), so we had no way of calling our friends for clarification. Plus we couldn’t really talk to the driver. As he grew even more agitated, Mr. Four suggested we got out of the taxi and go home. The driver was a little bit scary. Finally, we did get out. But not before the driver was swearing and yelling at us. I have never been so glad not to understand a language. His message was coming through loud and clear, even sans details. I also knew that whatever we paid him (because I had the small bills at that point) would not be enough. So when we were all out of the cab and firmly on the sidewalk, I told Mr. Four to start walking with the kids, and I gave the driver 7LE, a more than fair fare. He yelled and screamed and swore (we recognized some choice English words) and then he drove off. Ugh. Mr Four and I were a bit stressed. But we finally oriented ourselves and started walking, only to discover we were about two blocks from our friend’s apartment. And they were so great, we got over it. But, wow, I really hope never to see that man again. Now, I’m going to cheat and tell you about a third driver, the one who attempted to teach me basic navigational Arabic on the short ride from the metro to my house (3LE). I can’t remember any of it now, but he had me practicing left, right, stop, etc. He was an excellent ambassador. Ho, ho, ho, Merry Ramadan! 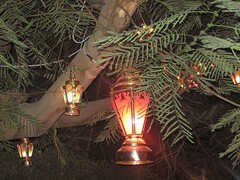 How does one decorate for Ramadan? Why, with Christmas lights, of course! And how do I know they’re Christmas lights? Because I saw some for sale today, and the boxes had some lovely pictures of Santa in the snow with his reindeer. Earlier in the week, I completely forgot. I bought a sandwich and drink and went outside and ate it. Then, after I finished, I realized how obnoxious that was, as I had been sitting in a busy area, surrounded by Egyptians. The strangest part of Ramadan has been how empty the streets are at iftar, as I mentioned in a previous post. Last night, I worked a bit later than usual, to about 5:15, and the metro was empty. It was glorious. I had an actual seat! And how much do they get for driving me the few minutes to my house from the metro? A whopping 3 LE, which is about fifty cents. And keep in mind I’m paying the inflated foreigner rate! 20 September 2007 Posted by Ms. Four | food, holidays	| Comments Off on Ho, ho, ho, Merry Ramadan! Bug thinks Ramadan is a person. More specifically, a man who stands in the street outside our apartment and pops balloons. The boys are enjoying our evening walks, new for Ramadan. If we leave our apartment right around dark, at 6:30pm (we’ve set the clocks back here already), the streets are empty of cars (think: Christmas morning, but warm, so more like Christmas morning in Florida), perfect for a casual stroll. 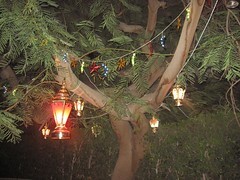 Plus the Ramadan lanterns are lit up, and the decorations are lovely. Mr. Four: Why do they need a whole month? Me: Well, the internet was really slow back then. And the Koran is a big book. It probably took that whole month to download. So Ramadan has not been nearly as challenging as expected for this family of non-observers. More on this in future posts. On a typical workday, I walk up two sets of stairs and down one to get to my train. Downtown, I walk down one set of stairs and up three to get to the street level. At my office, I walk up one set of stairs to get to the main entrance. And this doesn’t include stepping up or down curbs, which are about eight feet tall. Okay, maybe more like eight inches. Or maybe even twelve. Suffice it to say they are high. On a non-typical day, I might have to walk up three flights of stairs to get to my office, and up and down several flights to get to my apartment (though fortunately the elevator has always worked when we’ve needed to go up). All these stairs are good for me, but woe is me if I ever have a limp or crutches. This is not a city for the disabled. And speaking of elevators: my building has two elevators, side by side. The ground floor is zero. Neither elevator stops on the first floor. One of the elevators stops at every floor from two up. But the other elevator? It only stops at the odd numbered floors. Lucky for us, we live on an odd floor. But we are perplexed. Why the (sorta) exclusive elevator? Is rent higher on these floors? I need answers! Most of you readers, I suspect, are people who actually know us or are folks who have some connection to Ethiopian kids or Egypt or something or other. First off, for some of my colleagues, how about that natural language searching? Next, ethiopian corn? I can’t imagine that searcher found what they wanted here. And to answer the camel question: very big. And to answer the last question: yes, move to Cairo. Next, a few folks have asked about the pseudonyms. (Confession: my children’s names are not actually Giggle and Bug.) My kids’ names are unusual and I don’t want them to hate me even more as teenagers, so I’m trying to keep things a bit private. The cat had a pseudonym because I didn’t want to leave him out. And, yes, our nanny has a pseudonym, though careful readers will note I have given her a new Ethiopian name. How culturally sensitive of me. Mr. Four’s name has drawn some comments. 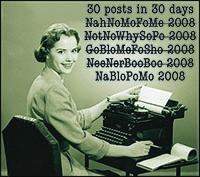 I was following a pretty common convention amongst women bloggers of called their partners Mr. NameoftheBlog. I’m open to suggestions for new psedonyms. If I pick yours, you win! 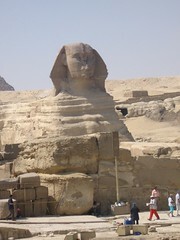 I’ll send you a postcard from Egypt. As soon as I can figure out where to buy postcards. Finally, another interesting note: have you ever used Google News alerts to send you an email when something is published in an area of interest? A friend of mine here in Cairo gets alerts when something about “Egypt” is published online. And she gets feeds from my blogs. That’s right. Google News is aggregating this very blog.